Belmore is a district and estate. O'Donovan gives the full name as Béal Mór Muintir Feodachain/Pheodachain in OSNB. See Máire MacNeill, 'The Festival of Lughnasa' (pp. 151-52) for details of the festive assembly on the mountain. Belmore Mountain is the highest hill in the Fermanagh/S Tyrone area and the 956th highest in Ireland. Belmore Mountain is the most southerly summit in the Fermanagh/S Tyrone area. 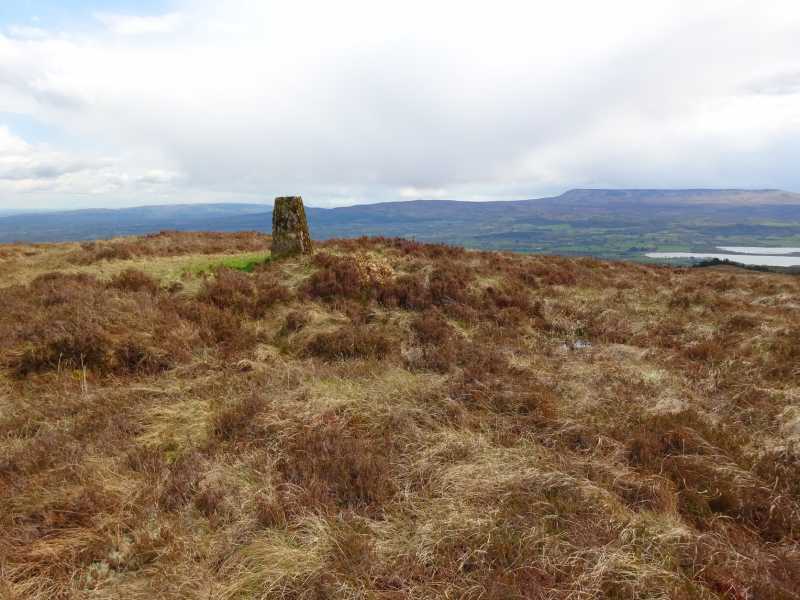 Belmore Mountain is the third highest point in county Fermanagh. Visited Belmore Mountain on a mostly sunny day in April 2018. Followed Harry Goodman's 2010 instructions which still hold true. The first 1.2km or so on the rough stony track to reach the tin shed at H1281342327 D was easy, while the remaining 1km or so over spongy and largely featureless moorland was more of a challenge, but overall not unpleasant. I could find no remaining sign of the old wireless mast near the trig pillar. Upon reaching the summit, lovely views open up all around, particularly towards Lough Macnean, Cuilcagh and Benaughlin.